Below is the transcript from the interview….. This is Jeff Rose and I’m doing something fun and different today. As you can see I’m actually sitting in a make-up studio with Emily Eddington who is a WSIL TV3 morning news anchor. This is actually a different, flip-the-script-type thing. Typically, I am on the morning news being interviewed by Emily. I have to wake up quite early for that, which she does every single day. Today though, I wanted to do something different and I wanted to interview her for something that she does. It’s a passion of hers. It involves some pink. It involves a lot of makeup, some lipstick, gloss, mascara, and some other makeup terms I’m probably not quite familiar with. What I really wanted to do first is just give an intro of how I stumble upon Emily and this passion of hers that she is doing. I had been on the News 3 for a few times being interviewed and one of her co-anchors had mentioned to me her Youtube channel. I had no idea what he was talking about. I knew of Emily as being the morning News 3 anchor, but did not know of her being a makeup expert. I went to her Youtube channel with curiosity and saw that she had hundreds of videos uploaded – I was blown away! What really caught my attention was she had just up uploaded a video not 17 hours prior and it already had between 15-20,000 views. I thought, “Oh my gosh, this is incredible!” To actually put a brand new video on there and to have that many people watch it in that short of time span, I knew that she was on to something. She had a very strong following, and I was just intrigue to learn more about it. That’s why I wanted to come today and just find more about Emily or her Beauty Broadcast, which is her Youtube channel. JEFF: First, I guess I’ll just start, when did you get interested in makeup and when did that start for you? EMILY: For me, makeup was just one of those natural things that girls get into around high school age. I was always interested in it. Anytime, I went with mom to the drugstore or to Wal-Mart, I would start to get this interest in trying something new and picking something up, seeing how I liked it, and the whole trial and error of makeup was really something I got hooked on. I remember helping my friends out in college, doing other people’s makeup just became one of those things that I started to do. Then, slowly I guess I started to realize what a makeup community there is online. A lot of that centers around Youtube. I started to stumble upon that, and that’s really when I got going. JEFF: You had mentioned you watching some Youtube videos of some other makeup artist, and you thought you could do this. EMILY: Yeah, I was just looking up information on a product. I Googled something and a video came up, so I watched that. I’m like, “This is great to not just go through and read something, but to hear someone explain it.” I don’t know. The information stayed with me a little bit more, and I just really took an interest in that, watched a lot of videos before I thought maybe I will try this. I was back in my apartment before we moved here and just got a really cheap little camera. The audio was bad. The video quality was not that good, but I just decided to start making a few videos and slowly built up a following on there. JEFF: Can you actually watch some of those earlier videos? Are they still live? EMILY: They’re still on there. Some people take down their earlier stuff and kind of try to pretend like that never happen, but I think it is sort of cool to see how it’s grown and see where it began and let people see that people don’t start out perfect on Youtube. It does take some time to build it up. JEFF: I think a lot of what you’ve done with your Youtube channel is a testament of you just have to go for it. You have to try it. You have to just jump right into it and learn as you go. I can apply that with the blog, Good Financial Cents to where I had no idea what I was doing. You just start. You watch, read a lot of blogs. I read a lot of tutorials and self taught myself. If I go back and look at some of my earlier articles and just how I did it, how it was formatted. I don’t want to say it’s embarrassing, but what you know now you can go back into the tools you have so that neat. EMILY: A lot of people will ask me how do you build up that following? How do you get people to come to your site and watch? I think some people expect that that’s going to happen in a matter of a few videos. Then they’re going to know, “Hey, I can do this or I can’t do it.” I kind of think of it as people trying to maybe open up a store and not having the shelves fully stocked. You just need to make a lot of videos and put a lot of stuff out there and just consistently do it. Then people will start to catch on and want to tweet it or link it or share it with their friends and give them something that they want to share. JEFF: You mentioned earlier about how you got to 2,000 subscribers on your channel. Can you remember as far as how many videos that took or how much time had passed to actually get to that first level? EMILY: Not for sure, but I’m thinking it was a little under a year before I got to that point. That was really exciting with every person that subscribed how exciting that was thinking, “Wow, this is really catching on!” Becoming a partner was sort of the next big step there. JEFF: So to actually become a Youtube partner you have to generate so many views on your channel, correct? EMILY: Yeah, you kind of need to show Youtube, I guess that you’re getting a decent amount of views and your making videos consistently so they don’t have the idea that once you make partner you’re not going to uphold your end of the deal. That allows them to post advertisements on your site and you can get some ad revenue if people click on those ads. JEFF: Actually, that was another thing I wanted to get to. I think the one thing I love about having a blog or any venture for that matter is if it is a passion of yours and it’s something that’s like a hobby almost. You do it and it’s not like work, it’s just because you want to do it because you enjoy doing it. To actually make revenue from that, that’s like living the dream. When you started Beauty Broadcast, that wasn’t your intent, that was just a side wind fall that came about, correct? EMILY: Yeah, it was really like that hobby that I wanted outside of my job. Doing news related stuff, while I really enjoy that, you’re not covering always stories that are maybe so uplifting or really leave you pumped up at the end of the day, if you know what I mean. I just wanted that hobby back. I’m out of college. I wasn’t doing cheerleading anymore. I wasn’t doing some of the things that I was used to doing, and I just wanted that thing to funnel some energy into and potentially help people. What keeps me doing it and what makes me keep feeling the need to make a new video every couple days is that I hear so much feedback from people that it really has helped them in their everyday life, so that’s what’s been really fun. JEFF: I know with the blog anytime I get an email from someone and they say, “Thank you for putting together that information to help me make that important financial decision,” that’s the payback. That’s the beauty of being able to do that and actually put information out there for people to help them out. That’s great. She’s Got a Mad Following! Some of the stats I hadn’t shared yet with her channel are you have over 105,000 subscribers, which I can’t even digest that. That’s just insane to me to have that many people that are dedicated, that they want the latest and greatest Beauty Broadcast. Then, you’ve had over 14 million visits on all your videos combined. Insane! That is tremendous. It just shows to have a true passion and having a want to do it and what the results can be. EMILY: Yeah, I have made a lot of videos to do that too. I’m well up over 500 videos now. Like I said, I’m not one of those real Youtube sensations that have put out some crazy video of their cat doing something amazing and then everybody in the world tunes in to watch it. Over the course of a lot of videos word has spread I think. I do hear from a lot of people that say a girl finds it, they tell their mom, their mom tells the rest of their family and then their all communicating about what they just saw or what they are going to try and go out and find based on what I’ve talked about, so that’s really cool. JEFF: It is cool. I remember my first month that I had my blog I was so excited when I cracked 25 visits for the day and how crazy that was. Then you get to 100 visits per day and it’s like you’re on top of the world. EMILY: That’s the neat thing about all this web-related stuff is that you do have hard numbers that you can look at and see exactly where it’s going. It’s very exciting and, I think really encouraging for people who do this kind of thing to be able to see word is spreading and it’s going somewhere. JEFF: Do you have any next steps or any projections of where you see Beauty Broadcast going to the next level? EMILY: One of the great things that has helped me so has been getting to be part of that on-the-rise pole. It was the first one that Youtube had done, and they asked me to be part of that. That gave me a jump in viewers and a little more exposure. I think more people were finding me that weren’t already in this just for makeup, but were stumbling upon the channel, just outsiders, I think. From there, I just hoped to continue making videos at the rate I am now. I try to put out three or four ever week and just continue doing the blogging and see where it goes. I do love it, and it does consume a lot of my time outside of my already full-time job, but like you said when you enjoy it, it doesn’t seem like really work. It’s more like you’re just fueling that hobby that you love. JEFF: Just for people that maybe are interesting to maybe doing a Youtube channel or blog, I know me personally when I first started my blog it was almost a secondary full-time job. Just having to learn how to do it and all the tips and tricks, and setting up a camera and learning how to edit. Now where I have kind of mastered the craft, I can probably do it in probably 10, maybe 15 hours depending on how much content I’m putting out. What would you say for you doing 3-4 videos per week how much time that takes up? EMILY: Strangely, it’s started taking me more time to produce my videos just because I’ve gotten a little more in depth with editing them. While I’ve got plenty of ideas floating through my head and the ideas video to video- usually a subscriber will say, “Hey, can you do something about this or I had a question about this.”- I’ve always got the ideas coming. That started cranking out faster. When it comes down to actually sitting down and putting the video together, I’m trying to get more creative with the process and that’s consumed a little more time. From the time that I sit down here to shoot something to the time that it’s edited and online, it could be five hours. I’m starting to do it in HD, so everything is slow on my computer now. Time consuming, but fun. JEFF: I’m not sure if you’ve read, but Tim Ferriss has his book “Four-hour Workweek” and then Gary Vaynerchuk’s book called “Crush It”. Gary talks a lot about your passion and when it’s your passion it doesn’t matter what you do because you enjoy it. With Tim Ferriss, his big thing with the “Four-hour Workweek” the concept is you spend four hours doing stuff you don’t want to do, but if you’re spending 30, 40, 50 hours a week doing Beauty Broadcast then time flies by because you enjoy the whole process. EMILY: Oh yeah! I’ll sit down, start doing something, turn around and be like, “How many hours have just past here that I’ve been doing this?” But yeah, I like it. JEFF: Anything else you want to add about the channel or anything else you want to say? EMILY: Thank you for asking to talk to me about it. It’s great to have you here and be in my pink room with me. I just thank anybody that has stumbled upon my channel and letting me know what they want to see because that is again what drives my content, is people telling me what videos they want. One of the biggest questions I get is, “How do you come up with video #515 or whatever?” It is from people just giving me ideas, so that’s where it comes from. JEFF: That’s great. 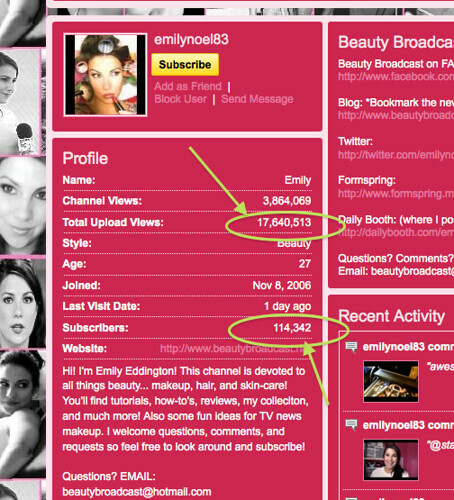 If you want more from Emily, you can go to her Youtube channel, which is Beauty Broadcast. You can also follow her on Twitter at Emilynoel83 and then she also has a corresponding blog, beautybroadcast.net. I will have some links here so you can see that. I appreciate the time and hopefully I can walk out of here without having any mascara or makeup on. EMILY: We’ll work on that after. JEFF: Sounds good. Thanks for joining us, and we’ll see you next time.